The Atik One 6.0 camera offers the exceptional Sony ICX694 sensor that offers high sensitivity, low noise and large dimensions in a new body with a more advanced cooling system (up to -38°C below the ambient temperature) and integrated filter wheel. 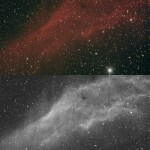 All to provide a powerful and easy to use system to achieve the best astropictures, with any kind of telescope! The Atik One 6.0 embodies the principles of Atik bringing high performance, a simple platform to use, with internal filter wheel, all in a very compact and lightweight package.